Please use the navigation bar (above) to access the texts. Much of the content provided on this site is provided in pdf format and requires a reader to view. Depending on your browser or device, the file may open in your browser window, in a separate window, or as a download. Beginning June 2016, I will be converting the pdf files to the archival format, "PDF/A," to help insure longevity of readibility. Depending on your PDF reader, the file may open as "read only" which may have the undesirable effect of disabling links in the document. Your pdf reader, however, should have a simple setting to "enable editing" (or a similar function) that will enable links. 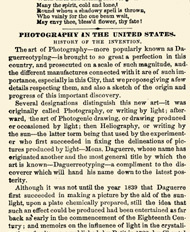 "Photography in the United States"